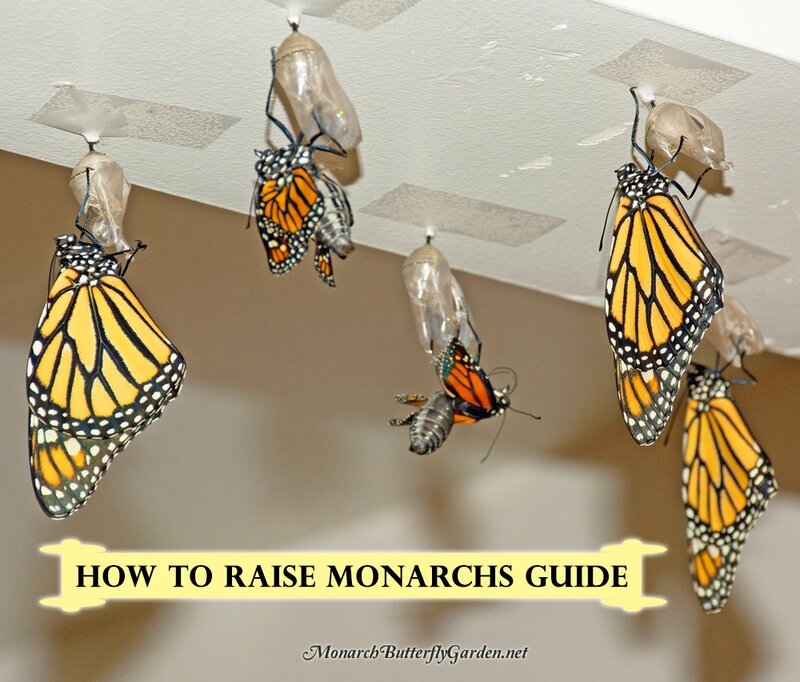 Raise More Monarchs with Less Effort and At Least a 90% Survival Rate! Monarch metamorphosis is nature at its awe-inspiring best. Watching a monarch change from egg, to caterpillar, to chrysalis in just 30 days is an amazing experience for kids of all ages. Over the past 35 years I have raised thousands of monarch butterflies from tiny eggs . During those first years, I was often disappointed, as monarchs would die in my care. But each time I failed, I learned valuable lessons that would increase my average survival rate to over 95%…less than 5% survive outdoors. What Raising Gems Will You Discover Inside? Finding eggs…even when there are none to be found! What if after reading reading this how to raise monarch butterflies book, you still have questions about raising monarch butterflies? You can ask me personally by posting them in the comments section at the bottom of this page or join our facebook group. Join our Closed Facebook Group so you can Ask Questions, Post Photos, and Discuss Raising Monarchs with other monarch enthusiasts across the country. Group details will be emailed with your raising guide receipt. This informative guide will pay for itself many times over as you save valuable time and money raising monarch butterflies. Start your raising journey by choosing the book or save 3$+ with a raising kit bundle. important note: Monarch eggs and/or caterpillars are not included in kits, but find egg hunting tips + suggested vendors inside the book. Please Click Here if you’re looking for Monarch Butterfly Books Volume 1 which shares 8 Helpful Butterfly Gardening Tips. Tony, your books and this site have been a saving grace for me. I fell into raising Monarchs unexpectedly this year. I have, what appears to be, a healthy male Monarch. However, he does not appear capable of flying more than ten feet at a time before fluttering down to the ground. He has been with me for three days now. I am prepared to keep him and have the food sources that you recommend. I live in western Pennsylvania, just a few miles from the Ohio border. Obviously, the Monarch won’t make the migration. How long do you think he will survive in a controlled environment? This is my first year with cultivated milkweed (swamp and butterfly weed) but the ol’ saying, plant it and they will come is soooo true! I have regular milkweed in my pasture areas too. I have learned so much from this group with the newsletters (love that they are addressed TO ME!!) I have released 7 so far, 3 had parasites or something wrong, one hatched but wings deformed. I have 7 more that just went to chrysalis and tagged my first one on 9/11. I will tag the rest when they eclose. Thank you for all the information you supply, planning on bigger and better things next season! Not clear if I put in Baby Draw Green Butterfly Cube with Single Leaves in Super Floral Tubes how will new cats find leaves or should I just put them from the leaves they are on on top of fresh milkweed on floor of cube? Have raised in cubes (on porch) from egg to Monarch as of today’s release (7) females and (7) males. My goal is (20) releases this year. I have (4) 3rd Instars in (2) separate cubes (outdoor) porch. I have been keeping detailed notes and they all have names. Awesome Experience and Awesome Photo Ops from Egg to Release. The cubes have really enhanced my Monarch experience. I found a fairly large Monarch caterpillar on my Butterfly milkweed plants last night. I just started out with a few plants (Common, Prairie and Butterfly milkweek) this spring and didn’t expect to attract any “visitors” the first year. Is there anything I can do to protect the caterpillar? I am not quite ready to bring him inside in a cage, maybe next year. He is about 1.5 inches long already. My daughter (5 years old) is so excited to see him turn. 1. What do first instar cat’s do after they eat their shell. This guy seems to just sit and temporarily shake his head. Is he fine? 2. Will a first instar cat eat a big common milkweed leaf? Should I cut the leaf into pieces? 3. Birds, squirrels,and rabbits regularly come to my backyard strait to the garden. I can’t really find anything to put on top of the garden (netting) and I don’t have any time to buy some. Is there anything I could do to put the animals away from the milkweed? Maybe I could use food to put them off track? I also want to say thank you for all your help and info from your websites. I am very exited since this is my first time in two years from seeing a monarch caterpillar and my first time in the U.S. (first in Okinawa, Japan). Hi Deb, it sounds like this butterfly might have already lived its best life. You rescued it, and gave it opportunities to feed. You could leave it outside by a nectar plant where it can feed. It probably won’t live very long, but it can enjoy its final moments in your garden. Hello, are the monarch butterflies affected by rainy weather? Monarchs won’t have issues flying in light rain with warm temps. Before heavy rains, they typically take shelter in tree foliage. Thanks for your PDF! I’m reading through it now. This is my first summer discovering monarch caterpillars in my yard. The place I found them is all over butterfly weed / A. tuberosa. Thoughts on this? I know your PDF mentioned it was hard to switch caterpillars to that when raising them. I’m in the northern Chicago suburbs. I did not raise these from eggs inside, but should I transfer them to boost survival rates? I have located about 8 caterpillars so far. All sizes of instars. Thanks Tony! Hi Sarah, you can bring caterpillars inside, but there’s more of a chance for parasites starting with caterpillars compared to eggs. As long as you’re ok with that possibility, bringing them in is fine. good luck! I am not sure you will be able to reply to this email, since it is a school account. I have no other gmail. Do you know when monarchs will arrive in Maryland so I can be prepared? I’ve just started raising butterflies on my own and my boyfriend built me a cage… I am learning about the survival rates as all do not survive either the caterpillar stage or the metamorphosis stage. I am interested in your book but I do not want a PDF file as my computer is not reliable and I’m old school- I like to have a book and bring it outside and read. How much is your book and or where can I get it… Is it also available online? I live in Southwest Florida so we have a longer season of butterflies than people up North. I have so far released 23 and have 25 more cocoons ready to go. (with lots more catapillars on my milkweeds out of the garden! :-)) all this in four weeks time! Tony, I am desperate for info. I got a large plant from plant market with 5 caterpillars on it, but know nothing about successfully getting them to hatch. Is 65 degrees too cold, should I bring the plant inside. It is rather large and nearly depleted of leaves. I did cover it with a mesh laundry basket, but what do I expect to happen now, how long for stages, what else do I do. I read many comments, but still need specifics. I don’t want these caterpillars to die, or go hungry. I am in Key West, but cold spell is down to low 60s and windy. How much sun do they need. I have the large pot sheltered, but little sun – too much wind to expose them too? What a great site this is! I have just started raising Monarch Caterpillars. I have some milkweed plants outside and I got tired of the heartbreak when something would happen to them outside. Anyhow, I have about 10 chrysalides and probably 10 caterpillars in two separate cages. In one cage, I had two caterpillars attach themselves to the side of the cage. Is this a big deal? Should I rehang them in a better spot? Another question: I noticed that a black fuzz ball forms near the top of some chrysalides as they form and hang around near the top, or cremaster, I guess. Is this normal? Lastly, I have about 4 large caterpillars outside in my yard and I’m debating whether or not to bring them inside to the cage. Thoughts? Hi Natalie, it’s best when they are hanging straight down from the ceiling or under a leaf so they can emerge easily from the chrysalis. There’s info about rehanging here. The ‘black fuzz’ you see at the top of the chrysalis is the caterpillar’s skin after it has been shed…sometimes it doesn’t fall off. This is not a big deal. It’s really up to you whether you want to raise indoors…the longer they are outside as caterpillars, the likelier you will be dealing with disease or parasite issues…good luck! Can. These. 2. Volumes. Be. Printed. Out??? Hi Margaret, both books are PDF files. This book is 100+ pages…you could print out, but you can’t access clickable links to other resources then. I have your monarch book, but I was hoping to see something about cleaning the mesh cages after the season is over. I tried flattening and soaking the biggest one in bleach solution (I hate bleach, so environmentally unfriendly on many levels). It was hard to find something big enough to soak it in and then what to do what all that solution. It did bleach out all the stains. It smelled for quite a while, even though I rinsed well with a hose. What do you use for cleaners? If bleach, what concentration, would hydrogen peroxide work, vinegar? What is your day to day cleaner? This was my first year “facilitating monarch childhoods” inside and it was baptism by fire as I released over 100. I am a professional animal keeper but with mammals! I understand the no pupae over caterpillars, but how can you really stop them? They crawl up overnight and pupate and I hate to tear them down. It’s a real chess game. I only have so many cages. It’s really hard with a whole lot of them. Thanks. You seem like a great person, good and patient teacher, especially when people ask the same question over and over. But you really need a how to clean section in your manual. I imagine bleach fumes are deadly to everything. I am new to rearing monarch butterflies… I planted only 2 asclepias curassavica milkweed plants in early spring.. I wasn’t counting on monarch butterflies to be laying eggs shortly after planting.. So I didn’t look for eggs or caterpillars in the 2 milkweed plants till July,August after they grew 2-3 feet tall… Then I inspected the plants and found caterpillars… I was new to this so I had no clue about Raising Monarchs..I assume by information I found on the internet that they were about 1-2 instars.. I had gathered 16 caterpillars from my 2 milkweed plants and took care of them with clippings and got 15 to the stage of chrysalis formation.. 1 caterpillar I lost to the NPV virus.. He/She turned black and became became a pile of liquid.. 🙁 it was separated when I noticed it didn’t look right from the other caterpillars so of the 15 that survived to start the transformation I’m sad to say that only 6 made it to chrysalis form and I was happy to release the 6 to start the next generation of monarchs. I’m not sure as to why of my 9/15 5th Instar caterpillars didn’t make it to Chrysalis form… I’m still Learning… I’m happy that I got 6… So Update as of 9/18/2017 I bought 3 more milkweed plants In mid August and got them planted. I also grew some seeds that made 2 more plants early summer so I have 7 milkweed plants now growing… I looked in my milkweed plants on 9/18/17 and found 18 eggs… I looked and found 2 more eggs on 9/20/17. Hoping last 2 hatch. So that makes 20 ….So I start a new cycle of raising Monarchs and hope to be more successful on my second batch! Will post an update on how they are doing…18 so far are growing bigger every day and are thriving..
My very first monarch eclosed on Sept. 20, and was healthy and flew away. The second one was a smaller chrysalis, turned very black, but the butterfly eclosed Sept. 21 and couldn’t fly. This morning it was still lying on the ground and the wings seemed crumpled….so I put it out of its misery. Hard to do, but I hope the right thing to do. The caterpillar it came from also seem d smaller from the start. Virus? Love your website and emails, Tony. Thank you! Hi Tony! So glad to have found this community of other Monarch lovers. I’m 62, living in Canada just north of Toronto, and I have been raising Monarchs since I was a kid! Now my daughter does it, and my daughter in law, and I’ve even gotten friends interested in raising Monarchs, all in the hopes of helping them to bounce back from the decrease in their numbers. Love reading all the questions and your answers! I still have 100 chrysalis not eclosed. Will they make it to Mexico or am I wasting my time at this time of year? Hello! I was wondering if anyone could tell me when the latest date to obtain and raise monarch caterpillars is for the northern New Jersey area? Hi Sam, this is cutting it close, but if you can get them this week you should be ok…good luck! I was just curious if the Monarchs I have released at the end of August might still lay eggs or do they just prepare for their long flight south? I haven’t found any eggs in the past 2 weeks. Hi Colinda, it’s possible that butterflies born in late August or early September could still mate and lay eggs further south. After that, most should be migrators. I just found your website last night, thank you for all the great information! Upon checking my milkweed this morning I found 7-10 caterpillars. Unfortunately I seem to live on an ant hill, are the ants on the milkweed a threat to the caterpillars? Should I attempt to bring them indoors or otherwise protect the caterpillars? Located in Southern California. Hi, I’m a beginner. I found a tiny caterpillar on an immature seed pod, I collected the entire pod to take indoors into my enclosure. Now there are three feasting on it. My question is whether seed pods are okay for them to eat? I have read that they only eat the leaves. I have provided plenty of fresh leaves but they seem to be drawn to the pod instead. Is this okay? I live in South Florida. We have successfully raised 8 Monarchs. I have noticed a problem with aphids on the milkweed. I have used dish soap in a spray bottle and then rinsed the milkweed with the hose. The milkweed is growing outside in the yard. Each day I rinse off the aphids with a hose but the next day they are back. Can you give me any advice to tackle this insect pest? Thanks for a great website. They have a slice of peach in the bottom of their habitat so I am not worried they don’t have food. I would like them to be free as soon as is safe. I started raising a few cats this year for the first time, bought a mesh cage and trying to follow all the tips in your book. One cat was doing really well right up to the 3rd day at 5th-instar, when he suddenly stopped eating and instead just wandered around all over the milkweed as if looking for something. Giving it fresh milkweed has no effect. Its frass looks normal and it certainly has a lot of energy. Could it be sick? He doesn’t look big/plump enough to be pupating yet (compared to others). Hi Kevin, all you can do in these situations is monitor and then separate if the caterpillar seems sick. There could be an issue but it’s also possible it could just be a smaller than average monarch…good luck! Aug. 19 update: the 5th instar cat soon stopped walking around, crawled to the top of the cage and formed a chrysalis. A few hours later it looked funny, with brownish spots. Next day a tachinid larva dropped out – ick! I brought it in as a 1-instar, collected from a roadside mow-zone. It must have already been infected. I also collected two eggs from the same plant. Hope they will be OK. I read that the tachinid fly only infects larva, not eggs. yes…tachinid flies lay eggs in the caterpillars so if you bring in monarch eggs, that eliminates tachinid issues. good luck! Its my first try at raising monarchs but unfortunately I under estimated the amount of milkweed required to plant to raise even one generation! hoping to get some common milkweed from my mothers house to help out. Great Information in both the book and web site , helped me out a lot! Hi Colinda, caterpillars don’t like being switched over TO butterfly weed (A. tuberosa). If I had to venture a guess, it’s because the leaves are rough and sapless compared to other species. If they start on tuberosa, they are fine. congrats on your first chrysalis! Thx that makes sense. I will start the next batch of cats on it, till I’m out. Some of my butterfly weed has small yellow dots on the leaves, I presume fungus since no evidence of sap suckers, But I cant seem to identify the type of fungus. I’M in Southern Ontario can be hot and humid. powdery mildew is the most common problem for me, and I just use a baking soda spray on that. I was going to try the peroxide spray as mentioned in previous comments. Can you put a name to it (if its fungus? ) could send a pic. if I could find a way to do so. Hi Grace, we know that they will eat it, but not sure of the side effects. I have heard metamorphosis can take longer, but there’s not really any data on this…good luck! I have 4 hatchlings on the single leaves in my damp paper towel tupperware incubator. How long do i leave the little guys in there? I moved one leaf with hatchling to a small milkweed plant i have here inside, but the tiny guy doesnt seem intetested in moving off his original leaf, which is drying out! Hi Trudy, I move them to cuttings pretty quickly after a day or 2. I have eggs on small leaf pieces with a new leaf underneath. They move over pretty quickly since the leaf piece is so small. Is there anyway I can raise my monarchs inside my house? We don’t have a porch or any safe place for outside monarch living as far as I know. The house is usually between 70-75 degrees Fahrenheit with lots of access to sunlight. I’d love to hear you opinion on what I should do since I hope to join the butterfly raising movement. Hi Ariel, that should be fine. You can always put them by an open window (if possible) on nice days. Welcome to the movement! I live in Central Florida, so we see Monarchs year round. I started growing them in March with 10 milkweed plants and I now have about 30 plants (some chewed down to the stems!). Currently, I have about 20 chrysalis (most of them are in a cage), 25 caterpillars from tiny to large and about 20 eggs. I check for aphids daily and remove them with a wet artist brush, place them in a cup of water, then flush them down the toilet. Next time I go to the nursery, I’ll pick up a bag of ladybugs. In addition to 2 cages, I recently purchased a Crop Protector – it is 8′ (yes, 8 feet) wide, 6′ high and 4′ deep. I have all my plants in there. Here’s my question: we have geckos (small lizards); do they eat caterpillars? They’re the only ones that can get into the new Crop Protector but as I’m missing a few cats, I’m wondering if they’re the ones eating them. Thanks so much for this site. It’s a FUN hobby and my husband now calls me Mother of Butterflies (instead of Mother of Dragons as in the HBO TV series Game of Thrones)! if I feed my yard with water soluble miracle grow plant food will it hurt the Monarchs? Hi Marie, if you purchased caterpillars you would need to find a Canadian vendor. However, the eastern population seems promising this season so there could be a better-than-average season in many regions of Canada. If you can’t find a vendor, I suggest working on the butterfly garden and check your milkweed regularly starting late spring and summer….good luck! I lived in Bismarck, ND for 2 years from 2014 to 2016 and my best friend got me started in saving the Monarch’s and the Bees. She has 3/4 of an acre of milkweed that I would love to have here in S. Florida. Here is some information https://gf.nd.gov/magazine/2017/jun/milkweeds-monarchs. Perhaps together we can all build a Monarch Highway! Hi Tony, I am WAY new to this! I planted milkweed in a little vegetable patch in our back yard last fall and lo and behold, I have monarch caterpillars happily munching away on it. Now, I have no idea what to do! I quickly realized I needed to protect them from a blue jay whose been eying them, so I have some netting over the plant (not butterfly netting, just netting to protect from birds; it was all I could find that day and needed something asap). Do I just hope and pray they make it? I’m discouraged now, reading your stat that only 5% survive outdoors. Any other tips on how to help these friends survive? Thank you! Hi Mollie, bird netting can protect caterpillars from birds, but there are many other predators it won’t protect against. Mosquito netting (with much smaller holes) would keep smaller flying predators out, but you’d still have to worry about predators already on the plants and predators that could come under the netting like spiders and lizards. I just recently moved to Oceanside, Ca. There are so many Monarchs here, I am over the moon happy. I have a store bought milkweed and I am also growing milkweed as I found out the Home Depot and Lowes plants are toxic. Four days ago I noticed that the Home Depot milkweed had 7 caterpillars on them. I read about how to bring them indoors and fix them a Tupperware home . I tried to get them off the store bought milkweed and give them what I was growing, but they wouldn’t touch it. Only the plant that was the host. Now I am devastated because they all died. Where did I go so wrong? I did send for chemical-free seeds that I’ll grow for next year, but what if they don’t eat it? I notice that the Monarchs are laying eggs like crazy on the “toxic” plant, not my home grown one. Will they suffer the same fate? Do I completely close the lid on the Tupperware container? It’s airtight and I worry. P.S. I am buying your book and a decent butterfly cage! from or what to do with it. Any suggestions? I cannot put it outside as it is very wintery. Any possibility I can keep it alive until spring when I can release it? I have two newly hatched monarchs. They are in the small cage I bought from you. It’s going to be a bit cool to release them for a couple of days. How do I keep their cage clean until they are release???? Thanks for any tips you have!! Hi Joanna, I wouldn’t worry about cleaning the butterfly cage until after they are released. The biggest disease concern is butterflies spreading potential disease to caterpillars. This is why caterpillars/butterflies shouldn’t be in cages at the same time. You can line the cage with a paper towel to absorb butterfly pee, but they don’t defecate. Last year I planted Allium ‘Summer Beauty’, and transplanted some onion chives so they were around my Tropical and Swamp milkweed to see if it would help with the overwhelming aphid problem I had in 2015. I am happy to report that in 2016 I saw a dramatic decrease in the aphids on my milkweed. I did not need to start squishing aphids until late September and October. The numbers were very low as well so keeping ahead of them was not very difficult. I want to try marigolds this year as I think they would be less expensive than purchasing more Allium. We have a large vegetable garden, and I am forever increasing the size and or changing up the flowers in my butterfly garden. Have you ever tried using Marigolds as an aphid deterrent? If you have, is there one type that seems to work better than another? I plan to try a couple of new types of milkweed so my milkweed numbers will increase between the new varieties, and the propagation of what I already have, so Marigolds came to mind. We have several crysalises hanging off the eaves on the back of our house. We usually wait until they hatch (I normally say “bloom” because they are like delicate flowers to me) and if they fall down we rescue them and put them in a screened habitat which my husband made in a hurry. We’ve had many make it this way, but our weather is supposed to get colder and rainy. Not sure what to do. Help. Thank you. Hi Lisa, late in the season I always raise indoors because cool temps slow down metamorphosis. As long as high temps are at least 50’s sunny (60s is better) they still have a chance. Hi Tony. I have 1 chrysalis left. I’m in Costa Mesa and it’s very nice out. Lows of 60ish and highs in 80’s. he just formed his chrysalis today and if we get a cold snap or rain ( yeah, right), I may have to feed him. You wrote to put humming bird nectar on cotton balls and put on top of the cube. Was that inside ( tape or something) or can they eat the nectar through the mesh and I should put it on top outside. Thanks. What is the best way to deal with an outbreak of NVP virus? I had some late season outdoor (wild laid) cats to contract it. I disposed of all I found in sealed plastic as well as all of the foliage of the milkweed plants in that area. I washed all my clothing and bleached the soles of the shoes I had on and washed them. I had some smaller cats inside. I was feeding them from a different patch of milkweed (I keep several separate patches around the yard.) Apparently the virus spread between the milkweed patches because I lost the inside cats, too, despite twice daily cage cleanings. I had rinsed all the milkweed in a 5 % bleach solution then plain water and dried before offering it. It is possible the virus came in before I noticed the dead cats outside. I am now going to remove all the remaining milkweed foliage in the yard and seal it in plastic to go to the dump. The native milkweed I have is all going dormant. What else should I do now for next year to protect the monarchs? I understand exposure to full sun will help kill the virus. I am in the greater Washington DC area so while I will have freezes I will not have extreme temperatures over winter. I had planned to overwinter some of my tropical milkweed but now plan to toss it all in sealed bags. All my milkweed is grown outside. Any and all help is welcome and greatly appreciated. Thank you. congratulations Kevin…I’m glad you were able to help her climb the cage to dry her wings. Thank you so much for this website – it is a wealth of information. I am very new to this and have 3 cats in various stages. I have one in a chrysalis which formed beautifully until at the very top. It looks like some small part of the cat is still exposed? It has been in chrysalis for about 7 days and is still green with gold rings. Also, can you change the type of milkweed you are giving a catepillar? I only ask because we only had 1 tropical milkweed plant and all the eggs were on that plant. Thanks! Hi Kelly, sometimes the skin won’t fall from the chrysalis and this is not an issue. Just continue to monitor its progress. Yes, you can switch varieties of milkweed. good luck! Hi Mixon, chrysalides are difficult to find in the garden, no matter what kind of milkweed you have. Tuberosa is not (usually) a preferred host plant for monarchs. The caterpillars have no issues eating it if that’s their original milkweed, but some have reported issues when trying to switch to tuberosa. You could always try to see if it works for you…good luck! PS..Jude’s work is amazing. I hope your wife enjoys her gift. so much to know- and I thought “I knew it all” Hah! Good read, tips, answers and encouragement. Getting frustrated! I have been bringing eggs inside. Once hatched, cats are surviving 3 – 5 days, then they die. I have been keeping the cats separated in small critter keepers. My cages are clean and my milkweed is not sprayed with chemicals. One cat leaked green fluid and then died. Another ate for a couple days, then shriveled up and died. Any ideas? Hi AJ, green fluid is a common symptom of pesticide exposure. Are you using new milkweed plants? Increased mosquito spraying in your area? Do your neighbors use pesticides that could have drifted? I hope you are able to figure out the source…good luck! I started putting the caterpillars on plants in a large tent. I have very good results mostly on raising the caterpillars and hatching them out. recently I have had several hatch out with deformed wings, one even with no wings. They are very much alive and try to survive so I put them in a cage with sugar water oranges and stalks to cling to until they die. Why does this happen. Is the tent to hot or are they getting stuck on the sides of the plastic. how fast will I get your pop up cage? I live in Oregon. Hi Linda, I ship out daily (except Sunday) and we use 2-3 day priority mail. I am wanting to buy a set for me and for my daughter. She has successful raised 5. The last one just flew off a minute ago. My question is can I buy one cage separately or do I need to buy 2 sets of books. I live in Az and she lives in Coronado island/San Diego. I just ordered your butterfly kit from gumroad and can’t wait to get it. I’ve been reading your emails for years but hadn’t seen any monarchs around here until this year and I think I found a couple of eggs so will set them aside. One thing I did notice is that it isn’t so easy to be sure they are the correct eggs with the naked eye. What do you suggest we use to be able to see the ridges on them? I’m sure after a while I’ll be able to tell right away but being a newbie I’m not positive. Any help would be great. I love the book and all the info in it and hope I can at least raise one monarch this year. Hi Enid, thank you so much for your kind words and support. Yes, the eggs are difficult to see and other things like sap or aphids can often be confused for eggs. I would suggest trying out some type of magnifying glass on amazon. I am researching this and will post more when I have a specific suggestion. I hope you enjoy your kit! I have been growing milkweed in my garden for several years with some minimal success with monarchs. I have a few neighbors that are starting to grow milkweed as well. I would like to increase the number of live butterflies by building a cage and protecting the eggs & catapillars. Your website is very informative and I would like to purchase your book, but do not have a “reader” and I really don’t want to print out 137 pages from my computer. Can I purchase you book in “book” form? Also, I see that there is a volume I and volume II. Is there a place can view a table of contents for these. Is Volume II an update of the first one, or does it have different material. Thank you so much for providing this opportunity to learn about raising the monarchs. Hi Marty, thanks for your comments. The books are both PDF files and can be read on your computer if you have adobe reader installed or another program that allows you to look at PDF files. The books are only available as downloads. When new info or resources come up, I edit the books and send a revised copy for free. 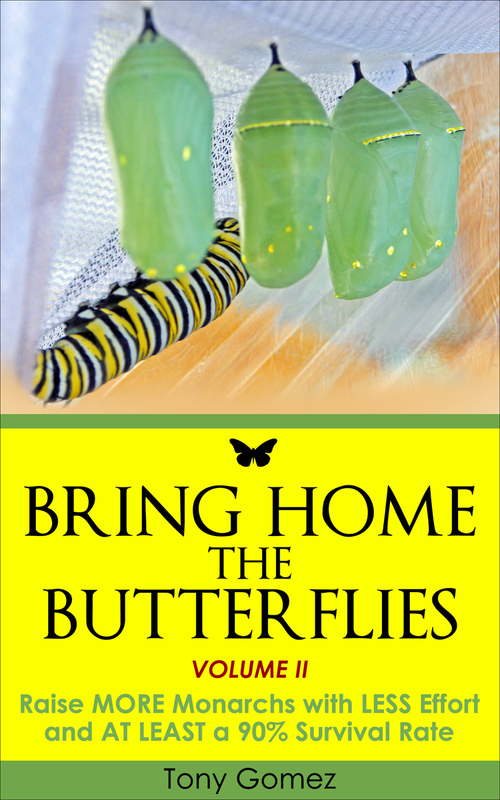 Book 1 is a gardening guide and book 2 is about raising/releasing monarchs. Hello from Louisiana. I have raised Monarchs/cats on and off for 20 years. When we moved I had difficulty with Milkweed growing, finally I have found a spot it will grow. Looking forward to a return of Monarchs. When my girls were in grade school I made cages and sent the caterpillars to school, kept them fed and the classes enjoyed watching the lifecycle and experiencing release of the butter flies. I even took them to work in a small aquarium, co-workers and customers enjoyed watching the lifecycle. I like to go to Lowes, purchase plants with cats on them and see the reactions of people when I “want” to buy plants with bugs and eaten leaves. “Then the education begins”. Purchased the book yesterday and will go back to purchase Vol. 1. Enjoyed Vol. II, found it very helpful. Looking forward to a Monarch bountiful future, hope everyone else has one too!!!! Lesson already learned this year. I had over 50 cats and bought plants from Lowes to tied them for a weekend trip. I had bought from there with live cats on them, so I didn’t think of it being a problem. Lost all but one cat. It was a sad loss. Waiting on my milkweed to regrow and the next batch of eggs. I work in a high school and am trying to help build up the population of Monarchs down here. We had about 46 chysalis’. Yesterday we had 3 butterflies emerge – 2 very healthy butterflies (one female and one male) and 1 not so healthy. The first 2 were released before the 3rd decided to come out. The third one landed on its back and his wings were very wet, I gave him my finger to grab on to, to lift him up to hang upside down. His wings did dry a bit but there was a yellow liquid in little balls (kind of like when we get a small cut) on his wing. Is this normal or is there something wrong? I am only able to plant in pots and not in the garden as my soil is unworkable. I am in WA. Will I have enough milkweed to support my monarchs as I will only have room for two large pots.? Hi Valerie, if you get 2-3 eggs on your plants at one time you’ll be fine. If you get more, the monarchs will likely run out of food. Think about where you might be able to find an immediate supply of pesticide-free milkweed plants if this occurs. good luck! I took your advice and took some cuttings from my tropical milkweed in hope of getting them root in a glass of water, like you had advised. For several weeks they did great. However, this past week, just after I noticed some starting to grow roots, the leaves started to yellow and shrivel up. Is this normal? I wouldn’t think so, however, this is my first attempt at doing this. I’m not sure what I have done wrong, I have let them alone in my kitchen window, which is not a particularly bright window. It gets maybe 1 hour of direct sun in the morning, but then nothing but indirect light for the rest of the day. Thanks for your help! I had removed all of the leaves with the exception of 2 or at the very top like you had said. A couple of days after I noticed the yellowing of the leaves, I noticed that the stems had started to rot, so I ended up throwing all of it out. I guess I will try again next year. Do you think it matters that I am in central Texas? Just finished reading “Raise More Monarchs” Vol 2. Awesome information, superb photos, great step by step processes, terrific coverage of the challenges and problems that could arise in raising Monarch Butterflies. I was looking forward to starting this “hobby” in a few months, here in Central Florida, and then this weekend, 21 caterpillars showed up on some potted swamp milkweed I was nurturing on my front porch, and on the tropical milkweeds that I should have cut down by December, and didn’t get time to trim back. Now I am hustling for food, and I appreciate having the alternative food ideas for the bigger cats, and having some idea of what the rest of the process is going to be like in raising these caterpillars. So very very grateful for your time and effort, your research and perseverance, your fine tuning the processes and resources to give us the advantage of your years of hard work. Hi Janice, thank you so much for your kind review and I hope you find the guide helpful as you begin your new hobby. It’s a learning process for sure, but the guide should help you achieve success much sooner. good luck with your first monarchs! I just finished reading through your new addition 2016.. especially ask the new info on how and when to release Monarchs that are enclosing now in January. . Our weather here in Southern Ca. Is unpredictable this year. Very cold nights and a lot of cloudy weather. Our most recent guy I held inside an extra day and even so- he didn’t want to leave so I brought him back inside for another night. when I took him outside today after the sun came out , he still didn’t act very peppy. I fed him a sweetened orange and it seemed to do it for him. Even with a few nectar flowers the extra orange seemed to give him a boost. I’m not sure where he would go from here ..
What I really would like to do this year is build some kind of butterfly sanctuary- do you have any sources for info with plans and ideas where to start?? Thanks for all you do to help us with this most wonderful hobby. Hi Ginny, I think you are asking for a butterfly garden design plan? I will add some planning resources to to the website the first week of February and will link to it in a February newsletter. Hi, I’m from Southern California , in late November / early December, I noticed caterpillars. I started taking them inside because I lost the last batch to predators, and because it was now getting too cold for them to survive and too cold for milkweed too.. Nights have dipped into the 40’s. Today, January 10, 2020, the first of 30 chrysalis has hatched and a healthy butterfly is hanging from the remainder of it’s chrysalis. It’s getting late and cold, rain is expected all week! What can I do to help them? I have more on the way! Hi Teresa, you will have to wait for a window to release them with high temps in the 60’s. If the day time highs are sunny and 60’s, they will be able to find enough warmth in trees to survive nights in the 40’s. Here’s more info about feeding and releasing them…good luck! It’s down to the 30’s outside and only up to 55-60 in the daytime. I’ve created a cage in my kitchen window build out, its well lit, but a little cool. They seem slow moving, not very active but healthy and when I play with them they perk up. They don’t seem the least bit interested in each other, and they don’t flutter/fly much. Are they too cold? Is that ok? Hi Roberta, you would need to create a habitat for them that kept them cool enough that they will stay in diapause (sexual immaturity) Otherwise, they may live for a few weeks up to a couple months. We don’t keep monarchs overwinter so I can’t share any first hand experience with you. Personally, I would release them during a warm spell (highs in 60’s or 70s) or drive them to the nearest overwintering area on the California coast and release them there. good luck! I’m so happy to find this site! I’m fairly new at this. I live in Central Mexico, and the Milkweed seeds I was given, and a few plants I was given to get me started seem to have some problems: lower leaves yellow, some leaves look like they have powdery mildew on the underside, some leaves get brown spots, one plant had leaves that were narrow and distorted. My mentor ordered two different varieties of milk weed, tuberosa, and incalmate. We live near Guadalajara at about 5,000 ft above sea level. I think the right variety would make a big difference in my success. At the moment I have 15 caterpillars 6 chrysalis and I gave 10 caterpillars to my mentor. Since I started 2 months go I have released 7, 3 of my Chysallis have died. My larvae was found about 2 weeks ago on the milkweed I had planted. I brought him in and fed him with leaves from mw. About 2 weeks later on Nov 12, 2015 he began to pubate. Today is the Nov 16, 2015 and the head of the larvae has not dropped off. Is this normal. Have read all of the comments and nothing was said about this. Thank you for your website. Is helpful. I can take a picture for you, but don’t know how to get it to you. One of my caterpillars has stopped eating and moving, and has actually kind of rolled over onto his side on the plastic cover of my cuttings jar. Is he just going through an instar change? I set down a heavy pot on the counter next to the enclosure and it looked like he jumped …felt the vibrations? Should I try to put him back up on the plant or just leave him there ? I hope he’s not dead…..never have seen one roll over on his side like that. This guy just HAS to live…..I literally rescued him from the trash can!! I had a big bucket that I was putting all my plant trimmings in, and among those was a few milkweed branches I had cut back so new ones would grow . A few days later a got the bucket of clippings to put them in the compost pile and….lo and behold….there was a plump little Monarch butterfly clinging to a milkweed leaf. There must have been a tiny cat on one of those leaves and he just kept feeding on the ones in the trash can with him. Weird. So of course I brought him in and put him in his own private butterfly enclosure and he was eating and crawling and then all of a sudden….he pooped out on me. Looks like there’s a black head coming out of the end of his skin……I know that sounds strange but could that be the beginning of his skin shedding? (I looked at it with a magnifying glass). Never noticed such a thing on any other caterpillar I’ve raised to butterfly-hood. Hi Mary, something black emerging from the caterpillar doesn’t sound like a good sign, especially if it’s something you’ve never seen before. Keep in mind, less than 5% survive outdoors so you are giving them a much better chance at survival. Unfortunately, sometimes there are issues with them before you bring them inside. There is nothing you can do about that. Good luck! I have 3 chrysalsis in a rubbermaid container (15″x12″x12″ ) that are 9 days old. The container is covered with a netting and secured with elastic. I am wondering if the chrysalis would be attacked by something if I remove the netting. They are close to becoming butterflies. I don’t want the butterflies to be injured by netting or be attacked if I remove the netting, since they have gotten this far unharmed. I have already lost 12 cats by not bringing them inside. This is my first time doing this. I have a total of 5 chrysalis and over 30 cats of various sizes and at least a dozen more eggs in a much larger rubbermaid container with the similar netting over the container. I am following the advice of using the cuttings in cups covered with the netting and some of the other advice given in this site. Thanks for your help. Hi Shirley, if they have enough room to dry their wings, they should be fine. Chrysalises can be attacked by wasps or eaten by birds, and so can freshly eclosed butterflies, so I would keep them protected. good luck! Am having trouble with milkweed wilting shortly after cutting. I am placing the cuttings in a bottle of water, but wilts within an hour? Hi Jean, always use a sharp pruner or knife to take cuttings. If the cutting doesn’t appear to be taking up water and wilts, you may need to recut it again. Thank you for writing this wonderful book, Tony. I would not have had the confidence to raise my dear caterpillars without your e-book. The pictures are gorgeous and the knowledge that’s shared within is truly invaluable. For those who wonder if it’s worth the price, it most definitely is. If you care about butterflies and want to increase their chances for survival, get this book as it is a wonderful resource guide written by one who has successfully raised caterpillars and released healthy butterflies year after year. Thank you again, Tony. Hi – first time raising butterflies this summer in Minnesota and released 121 successfully. I have lots of milkweed in my garden and therefore have harvested lots of seeds. I’m not sure how and when to plant them. I’ve tak n the silk off most of them although that gets to be a time taking task!! I asked a master gardener and they didn’t feel the 3 weeks in the fridge on a damp napkin does anything. Could you give me advice to planting please? I’m in central Minnesota. Thanks. Hi Judi, if you are fall planting seeds, they don’t need to be cold moist stratified in your refrigerator because they will get a natural stratification outdoors over winter. small plastic ‘cages’ I made. I’m confused though about the best mesh cages for the pupae. is good and ordered one from Amazon. Was this a mistake? fully grown cats into the mesh cage so they can form the pupae? Many thanks for your fabulous website. PS They poop so much that I clean the cages 3x day! Hi Allison, congrats on raising your first monarchs. You can still use the cage you got from amazon, but it might work better for releasing butterflies. If you are using cuttings containers to raise monarchs, it’s easy to just move the container with the caterpillars on the cuttings into a new cage. good luck! Thanks for such a quick response and your great suggestions. and late in the season.) They stopped eating and are behaving strangely. eating away. I’m learning a lot and know I shouldn’t get my hopes up. about what to do? Thanks so much!! “In cases like this, it’s likely that the customer is using an out of date browser on a Windows PC. They should try the purchase again in an updated browser or a different browser. What is your Facebook page? I know it’s closed, but is it mandatory to purchase your book before being approved as a member? For two summers, I have grown milkweed in my central Florida backyard without pesticides, struggling a little with aphids and a lot with caterpillar-eating brown and yellow wasps, and last year (2014), I saved over 100 monarch caterpillars, raised them in my screened-in back porch, and released over 100 healthy butterflies back into my yard. At one point, I started having trouble with newly eclosed monarchs falling, so I bought some pop-up butterfly net enclosures and began using them instead of allowing “free range” growth on my porch because a butterfly expert told me that little parasitic wasps could be getting into my porch through our screens. I bought some pop-ups that are big enough to put a potted milkweed inside for the cats to devour. I began to have healthy butterflies eclosing again. This year, however, I have had a terrible success rate, less than 50% hatching into healthy butterflies. This spring and summer, I always put the cats in the pop-ups, so it couldn’t be those wasps damaging the chrysalises unless the wasps were already on the milkweed plants that I put into the pop-ups. Yes, I too noticed moldy frass in the pots, so I thought maybe the high humidity and mold was causing the issues, but then, I began to think it’s that by having ten or fifteen cats together in a popup, I am spreading OE!! Anyway, it was very, very sad this year, and now I have not seen a monarch in my backyard for two months. In one of your posts, you write something about the milkweed being covered with OE spores if re-used. Should I rip out all of my milkweed and start fresh each spring? Also, can I or should I put netting over the milkweed in my yard to keep away the big wasps that love to chow on my caterpillars? Would that be better than trying to save the monarchs by raising them in the pop-ups or just on plants in my screened in porch? I definitely had more success when I did NOT use the pop-ups and just let the monarchs freely eat and crawl and turn into butterflies in my porch. I hope you can help because I seriously miss seeing monarchs flit around my yard. Hi Gini, OE spores are spread by adult butterflies, not caterpillars. By disinfecting the cage and thoroughly rinsing milkweed with water, you can reduce the risk of infection. Florida is a problem region because of the continuous growing season and year-round monarch population. It’s also a good idea to cut back milkweed plants once a year to let healthy new growth emerge…good luck! I have a question. I have 2 milkweed plants. Asclepias curassavica. I had 3 caterpillars but 2 disappeared. I think they just wandered away because I kept finding them outside of the planter so I would put them back on a leaf. Well I am now down to 2. One has turned into a chrysalis, but not on the plant. It’s on the side of my garage. There are so many spiders there. Should I move it back to the plant? The other one is still on the plant, but I don’t want it to escape. Am I worrying too much or is there any thing I can do? Please help. I have a cat that wandered away from the cut milkweed in our bay window and has now made a button on a vertical part of the window trim instead of a horizontal section where he can hang down. I don’t think this will end well when he tries to form a J against the window trim. Is there any way I can salvage the situation by moving him before or after he makes a J? Right now he is attached to the silk button and will probably drop into a J in the next few hours. Thanks in advance if you are able to give me any advice! Hi Randy, you can try to remove the monarch as a caterpillar, or a chrysalis. The caterpillar might try to attack you, but it can’t hurt you so don’t be alarmed. You can remove the caterpillar/chrysalis by putting scotch tape on the silk around the button and then pulling the tape to loosen the silk and remove. Or spray the area around the button with water and then loosen silk with a needlenose tweezer or pin. good luck! The scotch tape trick worked perfectly! Thanks so much, Tony. My question is at this time of the season will these Monarchs be a part of the great migration south ? I am in zone 5b in Illinois. Hi Mitzi, I’m in 5a (Minneapolis) and I typically see eggs/mating through the end of August. September born butterflies should be the migration generation. This should be similar for your region…good luck with your monarchs! We have a Monarch that exited its chrysalis on Friday morning. After allowing plenty of undisturbed drying time, we released it on some cut flowers (coneflowers, etc.) on Saturday morning. It is late-night Saturday and the Monarch hasn’t left. We just brought it back inside to its habitat and will try some hummingbird nectar on a cotton ball and an orange slice. Is there anything else we can do? It looks perfect and beautiful–just not flying. Thanks for the quick reply, Tony. Our “perfect to the eye” Monarch is barely moving today. I think we’re losing her. So sad. FYI: I’ve tried a bunch of times to purchase your book (Vol 2) via Paypal, but it’s not connecting. I’ll try again during the week. My neighbor (the Monarch parent 🙂 and I want to be better prepared for next year. congratulations Gail!Glad you were able to bring the caterpillar in. It sounds like you might have seen a milkweed bug or beetle. The bugs can eat eggs or small caterpillars but I don’t think they are one of the predators to really worry about. We leave most predators on milkweed unless the numbers are getting out of control. When you start removing everything that could potentially harm a monarch, the monarchs are sitting ducks for the remaining predators you can’t remove like wasps. The best way to boost their numbers is what you’re doing…bringing a few indoors. Tony, I finally saw a monarch in my yard yesterday this season and she left me several eggs. However they are all on the flowers of my tropical milkweed. I’m not sure what to do. Should I wait until they hatch or remove the blooms and put them in one of my critter keepers. Last year the eggs I brought inside that were on flowers did not survive. What are my best options? Thank you. Hi Karyn, I would either wait until they hatch (there is a risk a predator will find the eggs) or just bring in a small flower piece or individual bud the egg is on. You can use a food storage container as a hatchery. Mist the egg, set it inside the container, and close the lid. This keeps more moisture in so the bud/flower won’t dry up. Good luck! One answer to KC confused me about viability of female eggs being ferterlized when she layed them. I thought ske had to mate first. Did I understand or read wrong? Thank you. Could you tell me what the best way to feed Monarch caterpillars, stem cuttings or pot plants? The first time I raise them and have a problem, some of them got Oe. After that I raise them in a container sine eggs to 4-5 days old then moved them to a pot plant in a big tall mesh out door and I did as the way in this site advised and they were good all. Now, I am having a new problem. I have now almost 30 cats and some of them seems not right. Some are turning black. I just saw them this morning turn black but still eating and acting normal. I think they might get some bacterial so I separate them from other. So any advise, please. I live in Orlando, FL. It is humid and some more rain over hear. Thank you very much for all your helping me. Hi KC, sounds like bacterial or viral issue. We raise our caterpillars in a 3-season porch so their enclosure isn’t exposed to rain. You are making a good decision by separating potentially sick caterpillars, but you might want to consider a drier place to raise them. than you have a caterpillar on the table is that toxic. Hi Cam, glad to hear you have found the books helpful. Whenever I clean the mesh cages with bleach/ bleach cleaner I always rinse them out thoroughly with water and let them sun dry. It just my first day, I work at a small butterfly garden. I saw my trainer released a 15-minute old female Monarch butterfly by put her on a flower. I wanted to tell her to wait for a couple hours to let the butterfly get strong enough but I didn’t. Then later about 10-15 minutes, I saw the butterfly got met buy a male Monarch. I just feel bad for it because it just got release. Then I realized, if a 15-minute old female can be mate. Do you know? Thank you for all your answers and advices. Hi KC, the eggs aren’t fertilized until the female lays them, so she should “theoretically” be able to lay viable eggs. However, being plucked away before her wings are properly dried could damage the butterfly and render her unable to fly. It’s always best to let them dry for at least 2 hours before releasing them. Hope this helps! I have neither books. Can you read volume II without reading the first one? It is so hard to read a pdf. My computer is not always at hand. I hope you will consider putting your guide out in paperback, which would be great to have on hand to be able to leaf through at a moment’s notice. Is the guide available on Kindle yet? Hi Cyndy, I took the guide off amazon because it was too difficult to make simple changes and resend them if needed (ie resources links) I am not making any more changes to the books this season, but will consider other formats in the offseason. Thank you for your feedback! I used to plant parsley in my herb garden when I lived in Missouri, and I noticed a bunch of black/white/yellow striped caterpillars ate it down to the ground, after which I would get a second growth of parsley in the fall. Were those cats Monarchs? If so, should I try planting parsley, now that I live in Minnesota? I live in Houston, TX and this morning I walked out to 1 of my milkweed patches to find nothing but twigs. I knew that meant hungry caterpillars had been munching on the leaves and blooms. I found eleven 1/2 grown to almost grown cats (2 looked like they were hunting for a place to make a “J”). The weird thing is that 30-40 feet away was another milkweed patch and it has hardly been touched. Lots of leafy milkweed but yet I found only 1 tiny newborn cat. I wonder why the butterflies laid their eggs on one patch but not the other that is nearby? It is very weird. Could it be that the eaten milkweed patch was older, and butterflies hatched from that patch last year? I started moving caterpillars over to the bushy milkweed patch but noticed a wasp hovering over a dead little caterpillar. I think it had laid eggs in him as goo was running out. So, I decided to bring the cats inside. I have 2 butterfly castles so I have plenty of room. Four cats are now climbing to the top of the 6 foot butterfly castle and look like they are ready to make crystalis. Also, there are many predators that eat eggs and small caterpillars, so perhaps the reason the other milkweed was “untouched” was due to predation…impossible to know for sure. The reader mentioned wasps “hovering over the milkweed”. If the insects were truly “hovering”, perhaps they (or some of them) were hover flies (technically syphid flies) that have yellow and black stripes, resembling bees. They hover rather than fly around. They lay eggs on many plants, and their larva eat aphids, which could be a good thing! Just a thought…. Hi Callie, some males are territorial but new butterflies will be able to escape them if their wings are fully dry. Please refer to the updated butterfly release section in the guide. Thanks Tony! I don’t have the guide as of now but hope to order one soon. The butterfly was dry but I did help it escape. Do you have this guide in paperback? Tony, today I released a male monarch, immediately another butterfly came and attacked it, I thought maybe they were mating, I went over to see and the other butterfly was a male also. Do males fight each other…. Are they territorial?? I felt kind of bad for the butterfly I just released! I live in Orlando, FL. This is the second year I’ve tried growing plants from seed with no luck. The seeds I have came from last years plants. Any ideas why these don’t grow? Question #2…Large numbers of my caterpillers disappear. Three days ago I had 45 and today I have 20. Several times all of them have disappeared. Any ideas? Hi Skip, some milkweed seeds need cold stratification before planting and warm weather varieties have higher germination rates if you soak them in warm water 24 hours before planting. Monarch caterpillars have many predators including wasps, lizards, spiders, and ants. The best way to increase their survival rate is to raise a few indoors. It’s estimated that only between 1-5% survive outdoors. Is there any way that I can plant native (needing cold temps to sprout) milkweed this spring? I read that if you cold stratify in the fridge for 30 days it might be enough. Just wondering what your experience is? Hi Deb, you don’t mention where you live? The reason you want to plant milkweed seeds early is so small seedlings don’t succumb to summer heat. If you plant them a bit later than usual, keep an eye on them and make sure the soil doesn’t dry out. I would go ahead and plant them this spring. Good luck! Oops, left that important piece of information out! Zone 4 Minnesota. Thanks so much! I was afraid I waited too long! Three of my five chrysalids eclosed this morning, and they spent a couple of hours flexing their wings and roving about the cage. I put an orange slice on a plate in the cage, and it looks like they found it. I thought about keeping them overnight, but then I read in your book about the advisability of that. Since the days here in Manhattan Beach, CA are getting fairly warm, I decided to let them go. Two females were eager to fly away when I opened the cage, but the third, a male, hung around for quite some time. At last, he seems to have left the wall of the patio where I last saw him. I hope he will be OK.
Two chrysalids remain in the cage, both of them looking fairly dark, so I expect the butterflies to emerge tomorrow morning. When they are gone, it’ll be time to clean out the cage and get it ready for the next batch. A Monarch was seen flitting about my smallest asclepias tuberosa last week, and today I spotted four new caterpillars munching on the few leaves on the plant. I moved them to a larger plant that has many more leaves, and I’ll be getting more A. tuberosas next week. It’s only the end of March. Isn’t this a bit early for Monarch migration? Hi Bill, I’m glad to hear you’re having success raising monarchs and have found the book helpful. The spring migration typically begins in March but the timing can be affected by extreme weather patterns…the west has been unseasonably warm so I’d be surprised if they hadn’t started migrating. Congrats on all your spring monarchs! Is there a way of some sort to keep the wasp from getting the caterpillars? I like to keep the cage outdoors so the caterpillars are warm but I have problems with wasp? Hi Phyllis, do the cages you use to raise monarchs have holes large enough for wasps to enter? If so, I would consider another cage option. While wasps are not kind to caterpillars, they are good for pollinating plants so I wouldn’t suggest eliminating them from your garden. I am in the process of raising a few cats. I bought the large pop up you described in another post. I’ve followed your directions of misting with water and cleaning their grass daily. It’s about time for them to become Chrysalides but something is wrong. I have three that have started their chrysalisis, but appear to have stopped. I wish I could show you pictures of what’s going on. I am sad and song know what I can do to help them. A couple have died, although they appear healthy. I have another chrysalis that is almost perfect but it was a horizontal opening along the rim area. Any thoughts or advice on what I can do from here? I need to know if I did anything wrong so it can be prevented in the future. Also, I have many cats hanging in a j awaiting transformation but they look skinny to me, towards the top. I am also having a lot of issues. My cats are dying at a astronomical rate – 3 or 4 every day. Two have formed a chrysalis and both have died. I live in an area (south Florida) where heat is a problem for all of us, but I’m wondering if that is the culprit. I placed a thermometer in one mesh cage and it registered 90 degrees during the hottest part of the day. I tried spritzing with water to no avail. I have killed so many, I am discouraged enough to just give up. Hi Loraine, south Florida monarchs are often infected by OE disease due to reuse of milkweed plants. The milkweed becomes covered with OE spores from the butterflies and the caterpillars ingest them. Are you raising your monarchs indoors or in cages outside? 90 degrees should be OK as long as your caterpillars aren’t getting too much direct sun. Those temps alone will not cause the monarchs to perish. Some people in regions where milkweed doesn’t die back sterilize eggs and milkweed in a 20% bleach solution…even rinsing milkweed thoroughly with water will reduce the risk for potential disease issues. You could also establish more milkweed in your garden so overuse is less of an issue. I’m new to this site, and enjoyed reading all the helpful info. Thank you! You’re welcome Jacqulyen, I hope you have a successful season! You are preaching to the choir Robert! I know Chicago’s ridiculous weed ordinances are also frustrating some of you that are trying to help the monarch population recover. I hope legislators and the park district management will start listening to reason. Keep up the good work! Hi!! I bought Butterfly Milkweed from our local Lowes store and within 2 weeks I noticed a caterpillar less than a week later I found another one that was bigger, on the same plant!! We were blessed to be able to watch them from caterpillar to Chrysalis to eclosing, with photos/videos galore. During this time I was lucky enough to find 3 more milkweeds at other stores. We are now currently at 4 Butterfly Milkweed with at least 21 caterpillars!! I am on the hunt for more milkweed, though with it being December in Central Florida, I am not sure what kind of luck I will have. Just today we witnessed what we think is the female that we watched eclose, lay even MORE eggs on the milkweed. Is there anything that I need to do or should I just allow nature to take it’s course? Also, on 2 of the plants that I bought from another home improvement store (NOT Lowes), we have to constantly watch for aphids, we are daily controlling their population. 1) Will they harm the caterpillars and/or eggs? 2) Is there something natural that can be used in order to prevent them or is my lethal weapon fingers the only thing I should use? 3)Do we have too many cats and not enough milkweed? Hi Michelle, congrats on all your caterpillars! Aphids don’t harm monarchs, but they can negatively impact the health of your milkweed plants. It’s best to treat the plants when they are free of monarchs. for your last question, it typically only takes 1-2 monarchs to devour an entire milkweed plant. Hope this helps! Hi Michelle, I am also in Central Florida, near Tampa. Not sure what area you are in, but some of the reputable nurseries may still have some milkweed. I had a momma laying eggs this month and have cats hatching but have plenty of milkweed for them to eat. If you are near eastern Hillsborough County at all, give a call to Kerby’s Nursery in Seffner, they usually have some around. My other source is Hollie’s Farm & Garden in Lutz (northern Hillsborough). This past year not only did I start seeds to replace some milkweed that had died, but I bought 3 Giant Milkweed, which helped sustain a lot more lives without running out of food. It is only found at the reputable nurseries. I never buy milkweed from the big box stores in protest of them selling RoundUp which is responsible, among other things, for the demise of the Monarchs as it destroys the wild milkweed in the farm fields. Plus, you never know if they have sprayed their plants with something will harm the cats. Hope that helps. Good luck! I live in Central Florida also and it is challenging to release winter monarchs as Jan. and Feb. are our coldest weather with with increased chance of frost/freeze. I actually had one monarch for 6 days because of very bad weather which goes against my beliefs of raising but she wouldn’t have made it. So now I cut my milkweed down the end of October/early Nov. so this doesn’t happen and start raising again in the spring. Thank you Linn for sharing your first hand Florida raising experience…much appreciated! One of our butterflies emerged with a damaged wing. It wants to fly, but can’t really get off the ground, but it is very determined. Right now I have it in a butterfly house, but I want it to have the proper environment and nourishment. What would you recommend? ps. I feel somewhat responsible for the damaged wing- As I was bringing the chrysalis into the house because we were concerned about it’s safety during a recent windstorm, it detached and fell. I was able to get it to connect to the silk but there was a dent in the chrysalis and I am pretty certain that is where that wing was forming. Hi Ellen, I’m so sorry this happened. The first time I ever took down a chrysalis I dropped it on a wood floor and the butterfly never emerged. Monarchs like orange slices, watermelon slices, and you can experiment with other fruits too. What I’ve had most success with is dipping cotton balls in hummingbird nectar (or use sugar water) and letting them drink from those. You could also try gatorade as a substitute. Good luck! lots of babies and eggs in the backyard today. Do we know that the monarch eggs or caterpillars we buy from a retailer or organization and then raise at our homes find a migration route to Mexico? Hi Carol, that question can only be answered conclusively by researching tagging results and I’m not sure if anyone is even recording that type of data. Because monarchs take several environmental cues that tell them when to migrate and in what direction, my guess would be that monarchs bought from breeders would be able to migrate just like the locals. If you are concerned about buying from breeders, than focus your efforts on creating an irresistible butterfly garden so you’ll never have to buy eggs/caterpillars. I recently watched a nature program that observed them all migrate the same no matter where they started or how they were raised. Hi Lynne, until they use digital tags on monarchs to research their flight behavior remotely, statements like this are largely based on theories, because only a small % of paper tags are retrieved/reported when dead monarchs are found. I just purchased a Kindle edition of from Amazon (Kindle edition). However, I see that you have a volume 2 available. It seems that it is the same information. Should I cancel the Volume 1 order and try to get volume 2 from you? I did not see where to click to purchase volume 2, and I did not see Volume 2 listed on Amazon. Thanks for your help! Hi Cheryl, the second book is currently only available through a secure platform called gumroad as a PDF file, which can be viewed on most digital devices. I am exploring some more possibilities in the offseason and will be sure to announce if/when the book is available through other platforms. I had a problem this year with frass getting moldy in my potted milkweed. My potted tropical milkweed was placed inside my mesh BF cages and the cages were outside on my covered front porch. The plants were large and there isn’t an easy way to remove the frass from on top of the dirt. I tried placing potting soil over the dirt, thinking the frass would dry out quicker, but it didn’t work. Every time I move a large potted plant I take the chance of squishing the caterpillars. I’m in NJ and we had a really humid summer. I can’t think of a solution to this problem. I have never experienced that before, and I don’t clean out frass from the pots. I wouldn’t worry about it too much since the only time they would ever crawl in it is to crawl away from the pot. If you are worried about disease, you might try cuttings containers instead since it’s easy to clear frass from those and move them. I agree that regular moving of heavy pots is not safe for the caterpillars. Even though I ended up getting eggs on several potted plants, I’ve been using cuttings more because of predators. I brought in a tiny spider earlier in the season that killed a caterpillar…and for ‘raise the migration 2’ I brought another one in, but I detected its web when I was spraying the caterpillars…lucky! You can drape something over the top of the pot. I usually cut newspaper or paper towels so I can place the pieces around the top of the pot. You can manage to cover almost all of the pot area that catches the frass. This way, simply carefully remove the paper with frass each day when you clean the cage and replace with clean material. Hi Mary, covering the pot is a great idea for frass control. I still prefer cuttings for the other reasons listed in the guide: less predator issues, accidentally smashing caterpillars with the pot, plant health, portability. I came home today to a newly emerged BF that had obviously fallen before the wings had time to dry. Can it be saved or is euthanasia the only humane option? It’s eating now. butterflies usually don’t fall from their chrysalides unless there is a health issue. You could try keeping it indoors and feeding it cut nectar flowers, sugar water, or gatorade. I would not release it outdoors though because it could spread disease. If it seems weak, I would euthanize. Hope your next butterfly is a healthy one! I have tagged and released 41 so far with about 80 left to go. Do you have a recommended site for purchasing Monarch eggs or caterpillars? I’ll soon have enough milkweed and would like to start raising by late April early May!! I hope the book will be specific to different parts of the country. In the books I’ve seen before, this has been the hardest to figure out. I can hardly wait to see your book! I’ve broken it down so that gardeners & raisers can use different techniques depending on the time of year and how much milkweed is available. Anyone who reads the book can also ask questions in the comments section here. If I keep getting the same question over and over, I will edit the book and send everyone an updated copy at no additional cost to you. i have just been introduced to raising monarchs and i have found milkweeds along with monarchs in a park nearby, the larvae stage is survived however sadly during chrysalis i remain unsure of why my chrysalis appear to havethin lines of brown markings and yellow stains on and below their abdomens.